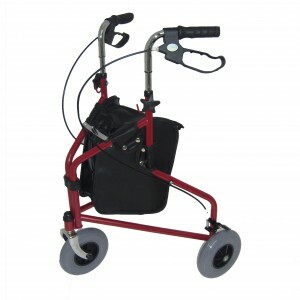 Ultra lightweight Triwalker has Lightweight solid 7″ wheels for indoor or outdoor use. Comes standard with vinyl bag. Handles are adjustable in height in 1 inch increments. This ultra lightweight tri walker will fold up easily without the need to remove parts. It will fold up with the bag still on it as long as the bag is empty. Weight capacity 115kg (18 stone).